Cinnamon Red the newest hotel of the John Keells Group will open in the second week on September in Colombo 7. The 20 storied hotels has been positioned as a business hotel said Ajit Gunewardene, President of the Leisure Group and Deputy Chairman of John Keells Holdings. The hotel will offer 240 rooms with the opening of this hotel. Cinnamon Hotels and Resorts will have 14 hotel properties and over 2,400 rooms and become one of the biggest hotel operators in Sri Lanka and the Maldives. Postal charges are to be increased from August 1, 2014; with the normal letter postage charge going up from Rs. 5 to Rs. 10 and the business mail (20 gram) rate from Rs. 5 to Rs. 15, Post Master General stated. He said the postal rates had been not been revised for the past six years and the Government had therefore decided to increase them now. The rates for parcel post would be increased from the Rs. 50 for 500 grams to Rs. 90. Thereafter an additional Rs. 20 would have to be paid for every 250 grams. The charges for bulk mail (mail bag) service would be increased from Rs. 5,000 to Rs. 7,500 annually. A new CCTV technology and an Automatic Number Plate Recognition (ANPR) system are to be installed n tie Colombo District Police said. The Sri Lanka CCTV system established in 2010 is operated under a Senior DIG and a DIG. The 105 closed circuit cameras installed at main intersections in the Colombo city continuous transmit images that are viewed in the control room on 28 LCD screens. The unit stores images for several toys and are used for “National Security Purposes, and the City traffic management that has a daily average of over 200,000 vehicles in the Colombo city. The new AN PR system is to capture an image of the number plates of vehicles automatically. The existing system would only take a picture of the entire frame as a whole. ‘Sometimes we would not be able to decipher the number plate from the image taken with the new system we would get good images of the number plates. CCTV cameras have also been installed in Kandy and Galle cities and are to be updated with the new system after Colombo. The project has been done in collaboration with the University of Moratuwa, Sri Lanka Telecom, and the Ceylon Electricity Board. Metropolitan office (Pvt) Ltd and the Colombo Municipal Council. A 10-year battery life, 10-bar water resistance and 10-meter dropping shock resistance. These were the three requirements of the “Triple 10” concept that led to developing G-SHOCK’s shock-resistant structure. The rugged shape and robust styling originated with an engineer’s brief calling for an ‘unbreakable watch”. Since its birth in 1983, G-SHOCK has continued its unrestrained evolution while retaining its unique basic structure. 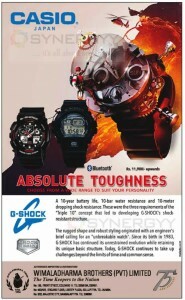 Today, G-SHOCK continues to take up challenges beyond the limits of time and common sense. Cargills Bank is a newest bank service in srilanka, Cargills Bank started its financial and banking operation recently and it is looking forward to acquire a financial institution in near future. 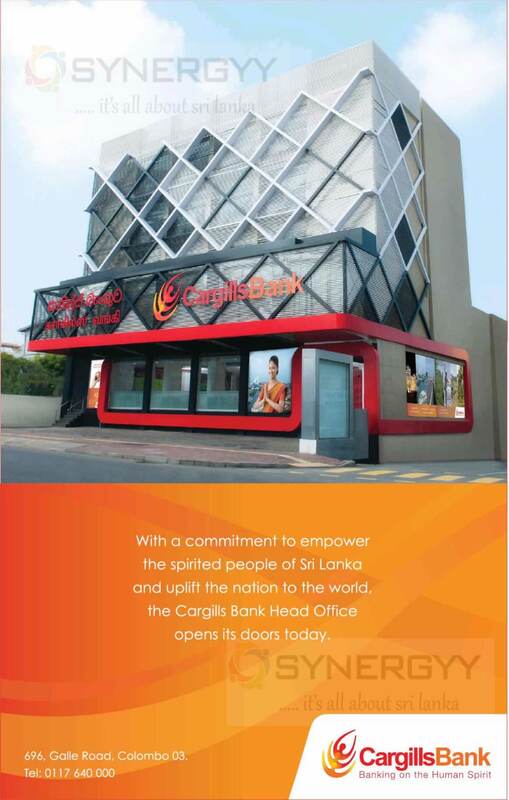 The Cargills Bank is commitment to empower the spirited people of Sri Lanka and uplift the nation to the world, the Cargills Bank Head Office opens its doors for your banking needs. 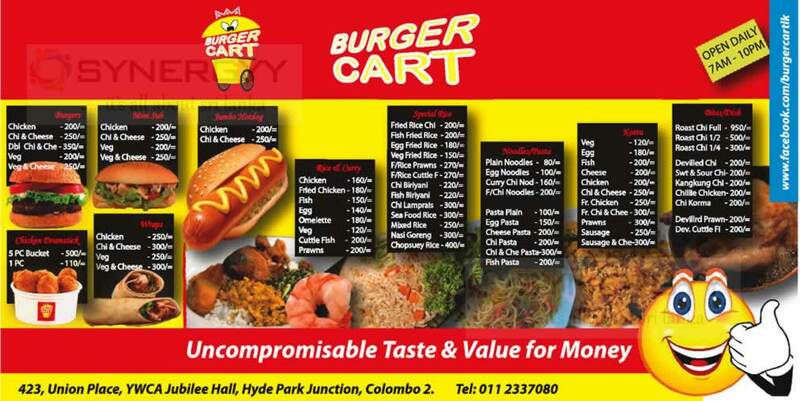 Burger Kings a Leading fast food trend maker in USA, now available in Srilanka with their range of menu and customized foods of King rice and Crunch Spice Burger. 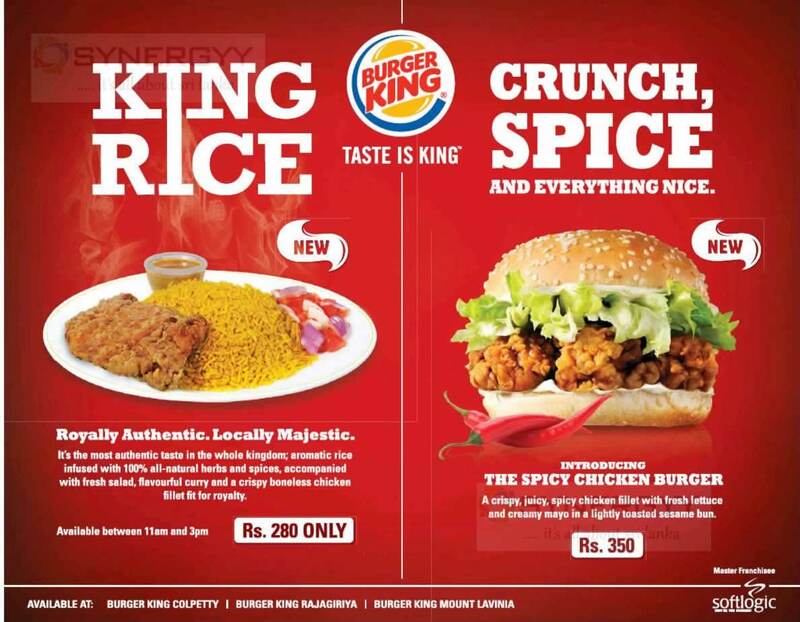 Burger King- King Rice is an royally authentic taste in the whole kingdom; aromatic rice infused with 100% all-natural herbs and spices, accompanied with fresh salad, flavourful curry and a crispy boneless chicken fillet fit for royalty. Burger King- King Rice is Available between 11am and 3pm for Rs. 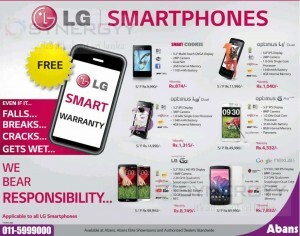 280/- only. And Burger Kings introduce the spicy chicken burger a crispy, juicy, spicy chicken fillet with fresh lettuce and creamy mayo in a lightly toasted sesame bun. The MP international organise an event for couples who looking forward to married, this event will covers whole solutions for the bridal needs. 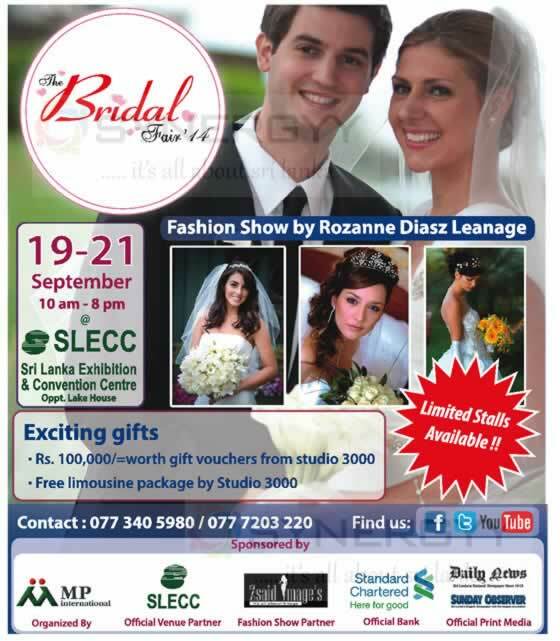 The Bridal Fair 2014 is schedule to be held at SLECC from 19th to 21st September 2014 from 10.00 Am to 8.00 Pm. 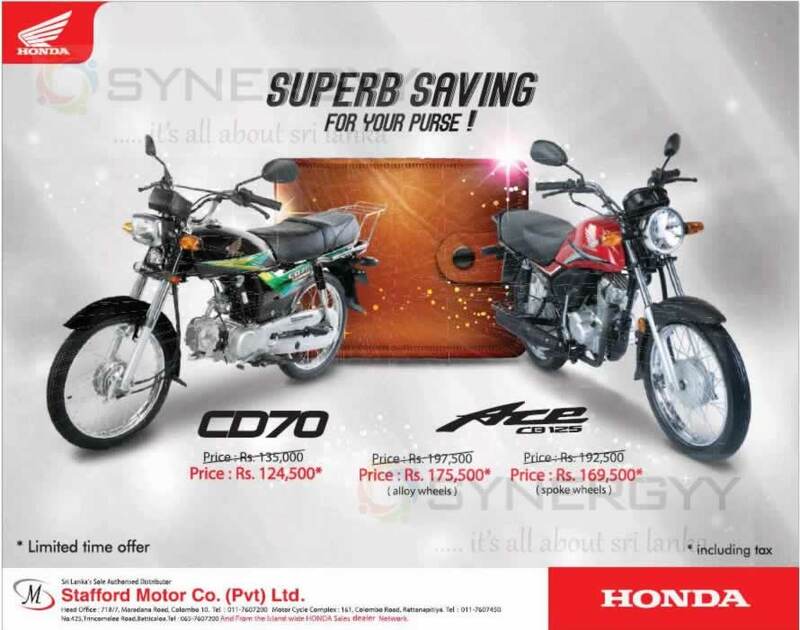 An exciting gifts are available for those who going to have their wedding after September 2014 with Rs. 100,000/=worth gift vouchers from studio 3000 and free limousine package by Studio 3000. Get first-hand information on import/export procedures in UK. 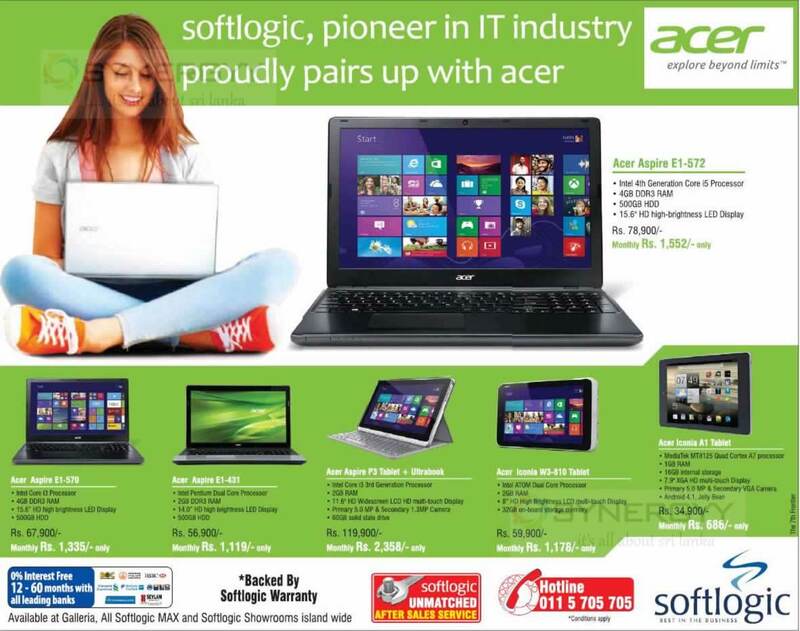 Negotiate better prices from your buyers/suppliers as our charges are very reasonable. We are experts in term bills and discount them at a lower rate, allowing you or your counterparty to get the best price advantage. 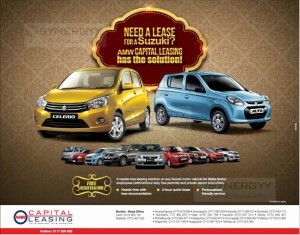 Your counterparty will be comfortable to deal with you as we are available at their door step. Ability to handle discrepant documents easily, with both ends being only a call away. Negotiations with Sri Lankan banks through us is easier and quicker for any problem solving. 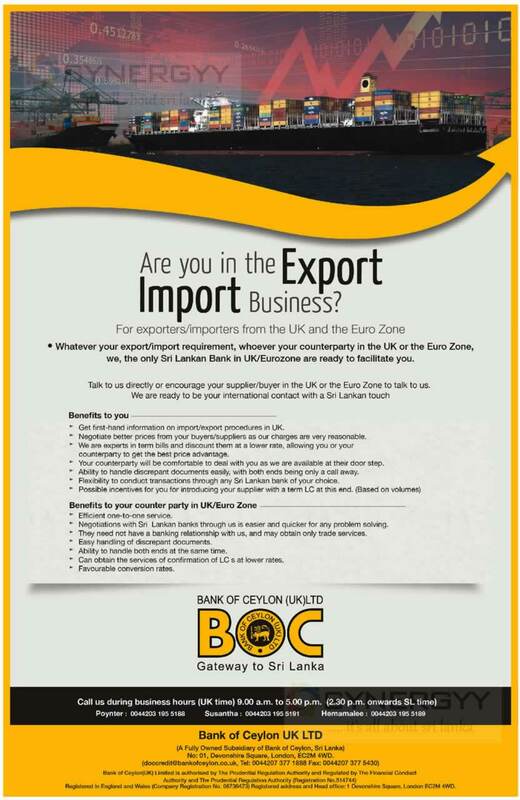 They need not have a banking relationship with us and may obtain only trade services. Easy handling of discrepant documents. Ability to handle both ends at the same time. Can obtain the services of confirmation of LC s at lower rates. Posted on July 16, 2014 Categories NEWS, Sri Lanka News, Sri Lanka Promotion and Discounts, Srilanka Developments and Releated News, Taxi, Budget taxi and other transport Service Offers, Travels, Tourism and Holiday package and EtcTags National Transport Commission (NTC), Srilanka - News, Srilanka Bus service, transport services in srilankaLeave a comment on How is your experience of Srilanka’s Long Distance Bus Travel? 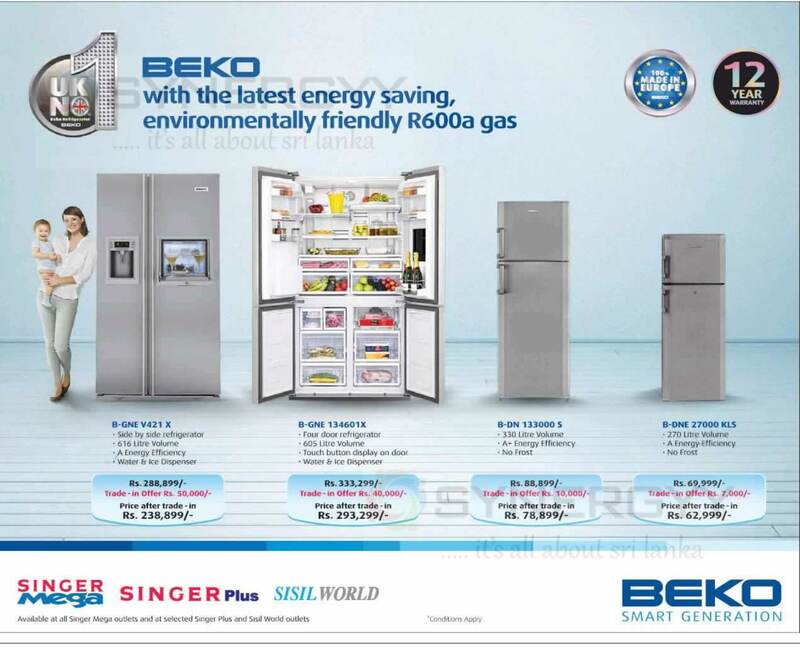 Singer Srilanka and its subsidiaries of Singer Mega, Singer Plus and Sisil world are offers a specially promotions for the BEKO Refrigerator. 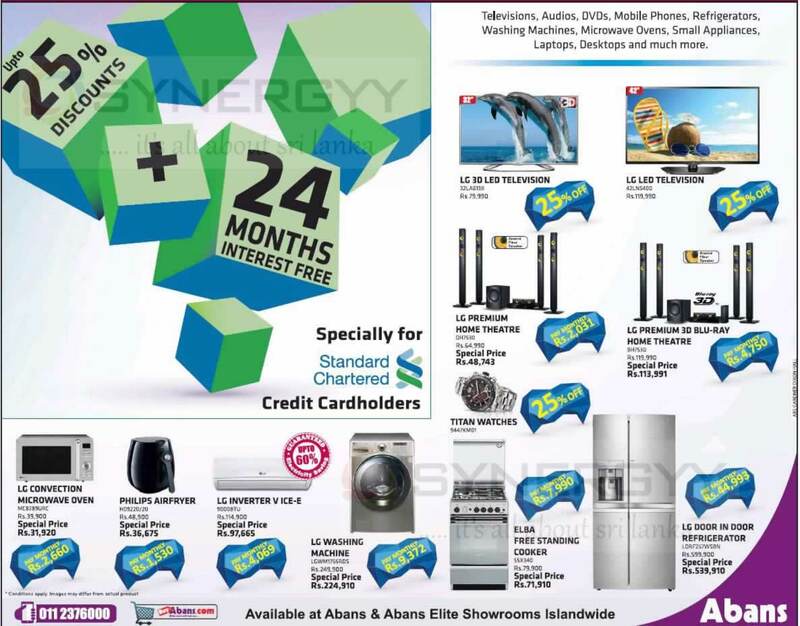 Abans offers 25% discounts and 24 months interest free services for the Standard Chartered Bank Credit cards for Televisions, Audios, DVDs, Mobile Phones, Refrigerators, Washing Machines, Microwave Ovens, Small Appliances, Laptops, Desktops and much more. 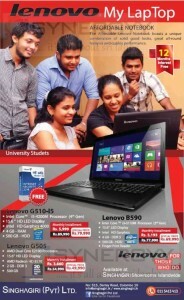 Abans Offers Toshiba 32” LED TV for Rs. 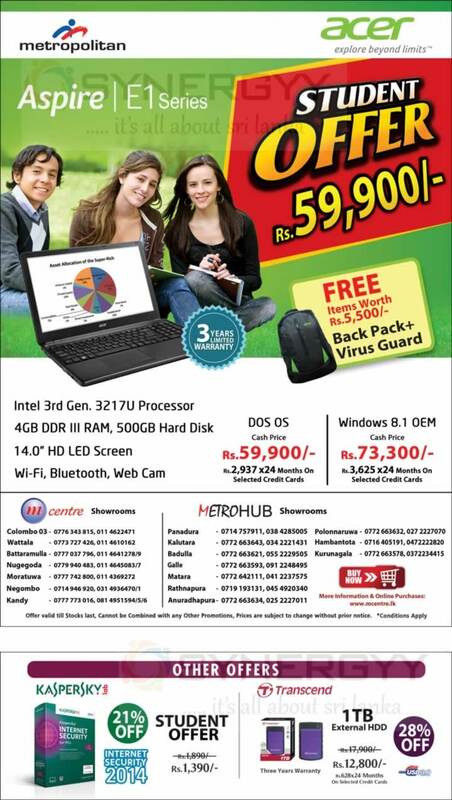 49,990.00 which is normally sell at Rs. 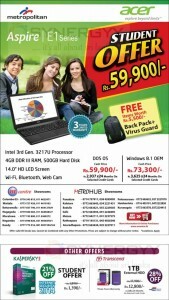 59,990.00. the Toshiba LED TV with High Definition experience and PC input option using HDMI. 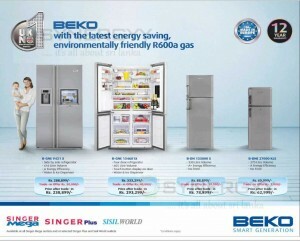 Customers who purchase a Refrigerator, Washing Machine, Microwave Oven, TV. Small Appliance or any Kitchen Appliance with an Abans Warranty during July, August & September 2014 from Abans Duty Free Shops & Abans Duty Free Dealers at Katunayake International Airport are eligible to participate. fly by helicopter promotion for 15 couples to habarana with one night stay at a luxary hotel. 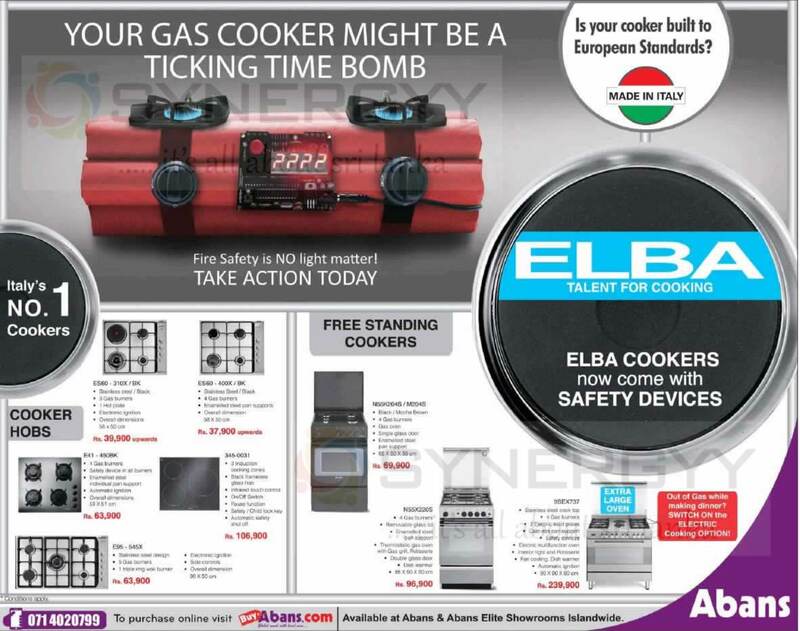 Abans Srilanka offers European Standard Cookers of ELBA cooker in Srilanka, do you aware the case or electricity cooker should a high safety control standard to maintain. 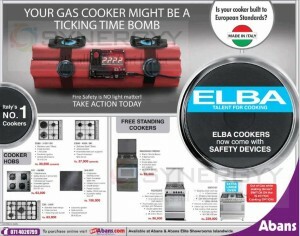 Therefore ELBA Cooker has fulfil all safety requirement. 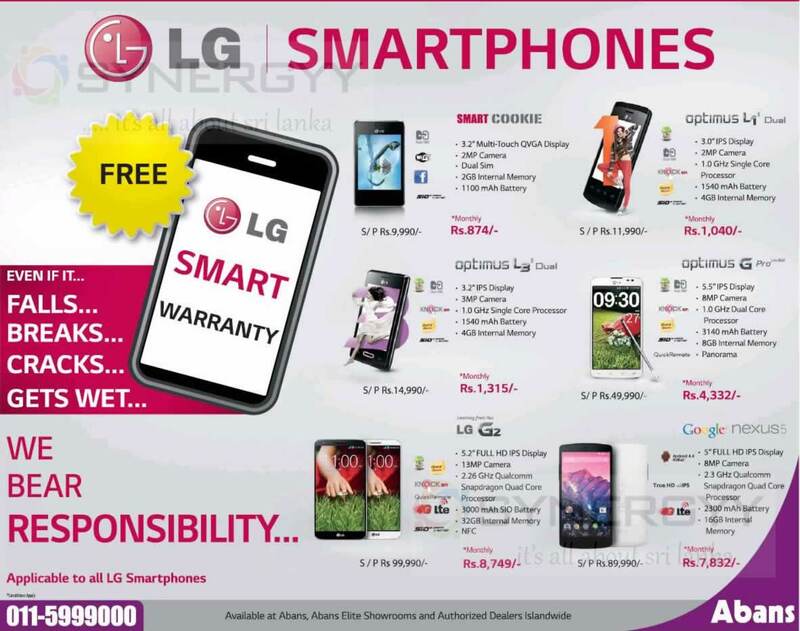 Abans an Authorised Dealer for a LG Smart phone in Srilanka offers wide range of technological advance mobile phones at an affordable price. 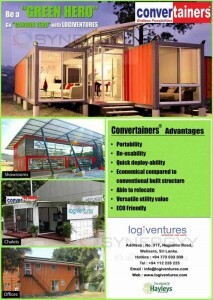 The Hayleys Logiventures offers you to own a Portable Container House/ Office/ Showroom or a chalet. 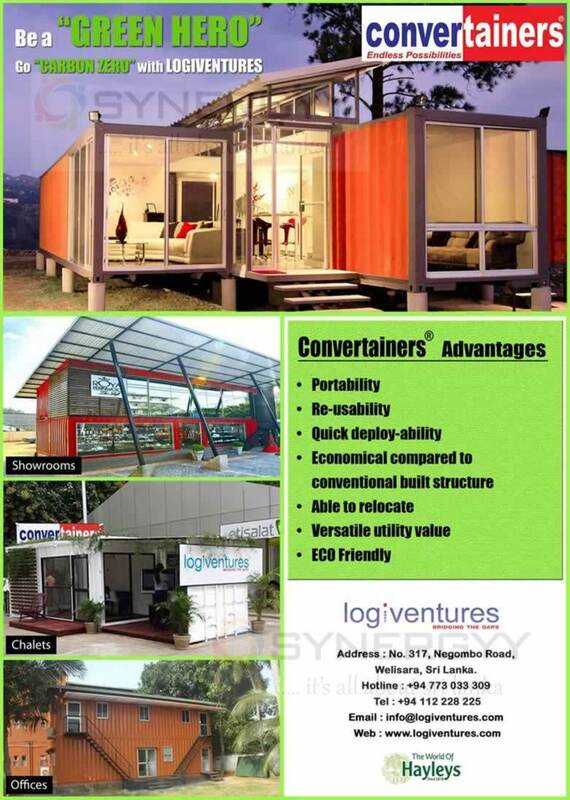 This portable Container house will gives you a strategic advantages of Portability, Re-usability, Quick deploy ability, Economical compared to conventional built structure, Able to relocate, Versatile utility value and ECO Friendly. For more details contact to Hayleys logiventures at No. 317, Negombo Road, Welisara, Sri Lanka. 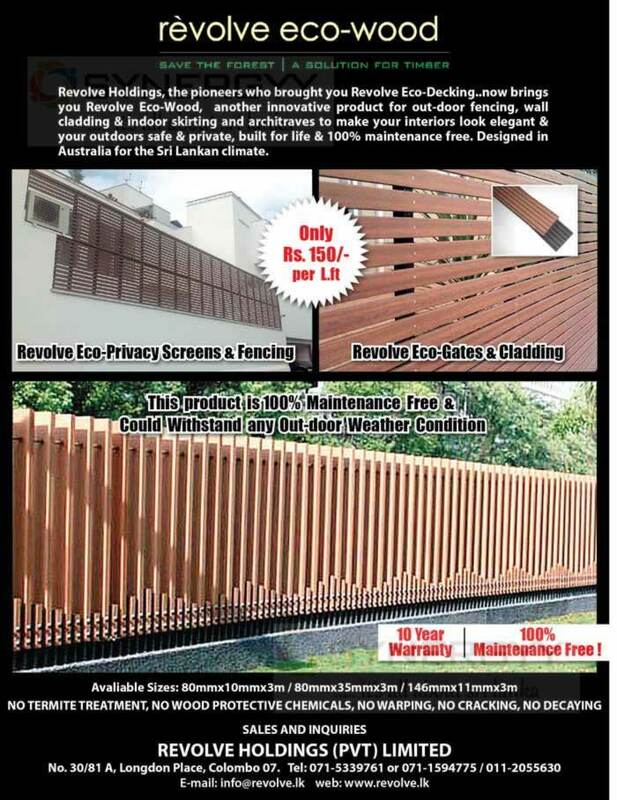 Revolve Holdings, the pioneers who brought you Revolve Eco-Decking..now brings you Revolve Eco-Wood, another innovative product for out-door fencing, wall cladding & indoor skirting and architraves to make your interiors look elegant & your outdoors safe & private, built for life & 100% maintenance free. 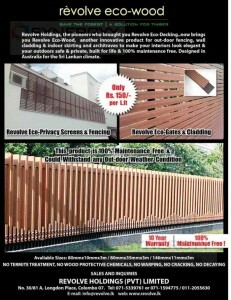 Designed in Australia for the Sri Lankan climate. 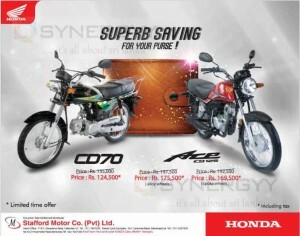 For more details about the prices and other information contact to Revolve Holdings Pvt Limited at No. 30/81 A, Longdon Place, Colombo 07.